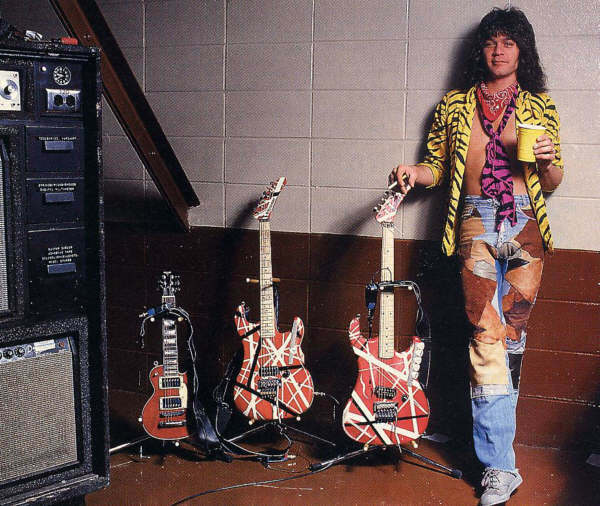 It's the Official 5150 guitar pictorial history thread! Paul Unkert built the custom one-piece maple neck. 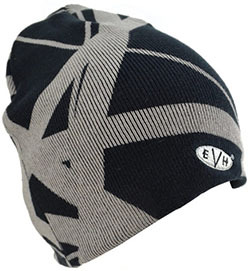 It was unusual in that it featured an asymmetrical back profile. The headstock shape was copied from an Explorer. The tuners were Gotoh 90 degree tuners. 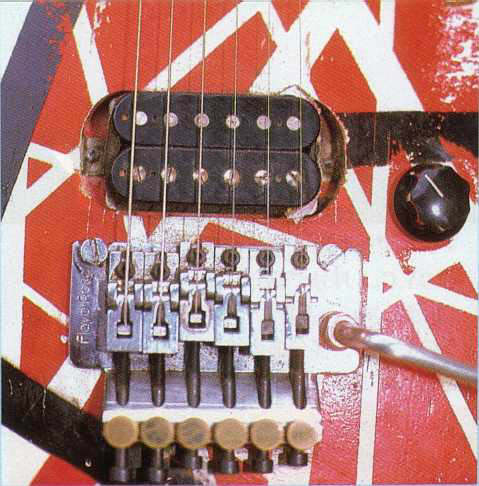 A rare, early prototype fine tuner Floyd Rose was installed. It is identified by it's non-centered 'Floyd Rose' logo and brass fine tuners. The nut is also unique from later Floyd nuts. The guitar soon to be known as 5150 is made by Paul Unkert. 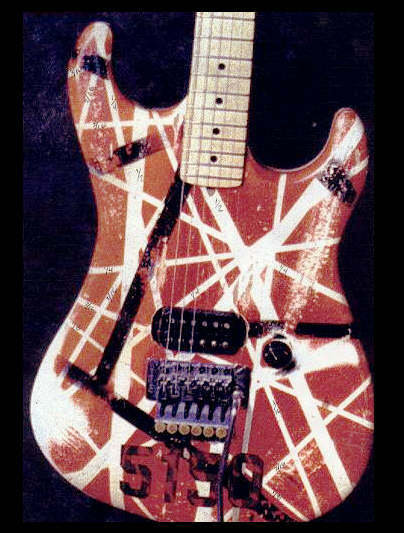 It's one of many similar guitars made for Ed at this time and was first used on the 1984 tour. It did not feature the '5150' spacetape yet. '5150' spacetape is placed on the body. "Life is like music; sometimes it's the silence in between the notes that is most important..."
One of Ed's more unusual inventions is installed; his patented guitar tray table. The Van Hagar era has arrived. 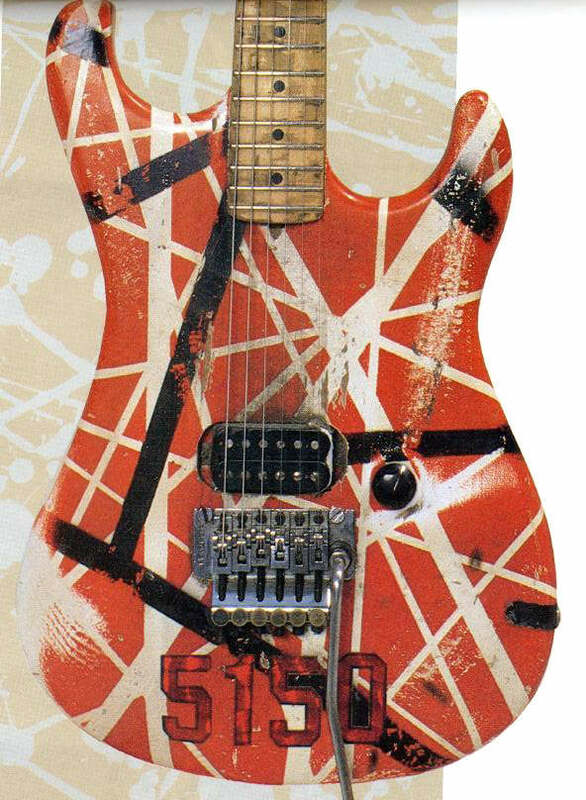 Ed has retired his old Frankenstrat at this point and turned to his 5150 guitar as his weapon of choice. 5150 takes an incredible beating as it survives through several world tours as Ed's main ax. It almost never leaves Ed's hands it seems. Of course that's the sign of a great guitar, one that you can never put down. Detail of the bridge and humbucker. Note the beginning of stress cracks. 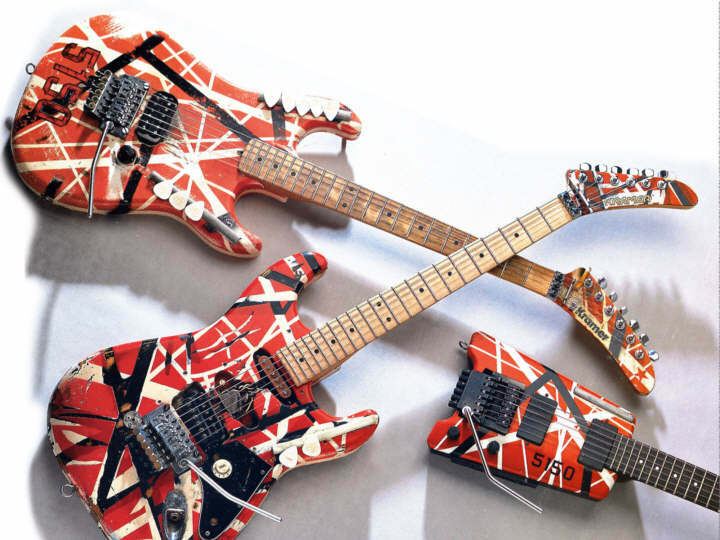 Heading towards retirement now itself, 5150 poses with the retired Frankenstrat. It's last recording is on the song 'Judgement Day'. Thus ends the career of 5150. The body it seems is truly 'swiss-cheesed'. Awesome thread man, also mention that the pup gets changed to the zebra pup (most likely a wolfgang) in the last few pics! Nice job...thanks again. Picked up a couple more nice pics. The poor folks play for keeps down here...They're the living dead. 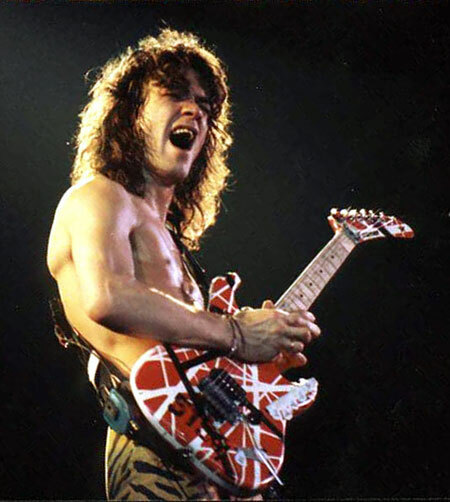 Nobody rules these streets at night like Van Halen!! 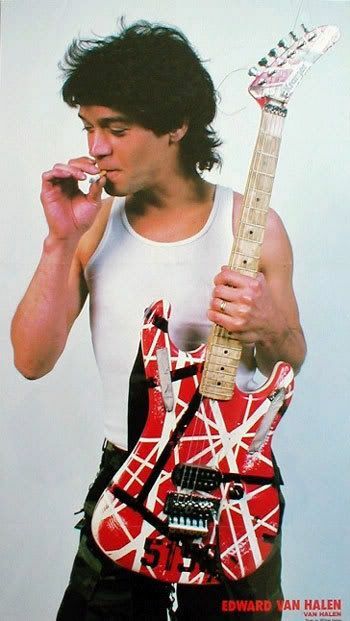 Thanks, this was the guitar that introduced me the Van Halen. Well done. I enjoyed that. The 5150 is definitely the guitar I most associate with Ed. More so than the Frank, actually. It's why my first guitar was a Kramer with banana neck (THE FOCUS 3000!) and the guitar he played when I first saw the band. It's the Live Without a Net guitar. So many great memories. If I ever purchased or built a replica, this would easily be the one. 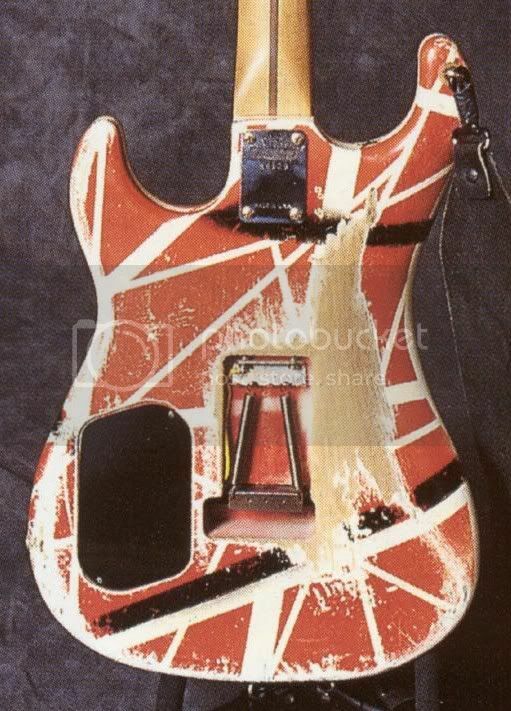 I'd really love to see Ed and Matt Bruck sit down with someone like Jas Obrecht or something and put together a book documenting Ed's famous guitars. If David Gilmour and Phil Taylor can do it for his Stratocaster, Ed and Matt Bruck can do it as well. My fav Eddie axe. LOVE the Strat body with the Explorer headstock. The pic from 04 with Ed playing the 5150 I took with my camera in the golden ring. Man that pic has been around the block since I first posted it years ago. Somehow it even made its way into a young guitar mag at one point. Ha ha. That was taken in Worcester MA on 6/20/04 on the 2nd Worcester show by yours truly. I was able to shake Ed's hand that night during jump. I have many other pics of Ed from that very night. Some not so flattering. Good to see my pic being put to good use.